Internet Service Providers could use the Hablaporinternet Cloud Solution for easy and fast billing and control of WiFi hotspots, broadband internet access, prepaid wifi service, ADSL, Cable Modem, WiMax, etc. Prepaid WiFi services enable Internet telephony service providers (ITSP) to offer wireless access services that customers can pay for in advance. The market for prepaid services includes tourists, immigrant communities, mobile populations such as military personnel, and people with limited credit histories. 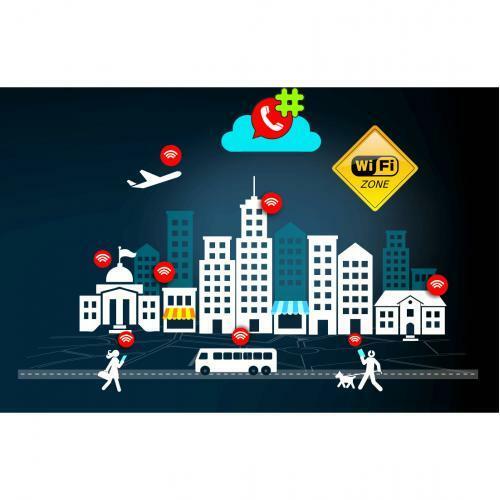 These users can all gain immediate access to WiFi services at key locations such as hotels, cafes by using prepaid WiFi cards (“vouchers” or “access codes”) purchased at supermarkets, online shops and other types of retail outlets. Prepaid WiFi access is a “purchase” transaction – so, at the moment of the authorization, the funds are withdrawn from the account and converted into the WiFi access time. This combination of services enables you to authorize prepaid WiFi access and debit individual user accounts in real time. Fixed bandwidth (download and /or upload) and unlimited data transfer, for a fixed monthly fee. Fixed bandwidth (download and /or upload) and a limited total data transfer amount, for a fixed monthly fee. A pay-as-you-go plan, where the customer is charged based on the amount of data transferred (per kilobyte, megabyte or gigabyte). You also would be able to assign a static IP to an account and restrict the number of simultaneous Internet sessions with the same Account ID. Start: 128 kbps upload and 512 kbps download bandwidth for $15.00 monthly. To provide all of your customers with adequate Internet usage you can design a service usage policy that eliminates service abuse or illegal service usage. You can do this by limiting the quota of Internet traffic per day. For example, a customer will be unable to download more than 1 GB of data in a single day; after that, the Internet will be blocked until the following day. Pro: 256 kbps upload, 1 Mbps download bandwidth and 20 GB of data transferred during peak hours and 30 GB of data transferred during nighttime hours for $30.00 monthly. You can limit upload / download bandwidth to 64 kbps after customer consumes his quota. Premium: 512 kbps upload, 2 Mbps download bandwidth and, data transfer up to 40 GB for $40.00 monthly. Data transfer above these thresholds is charged at $2.00 per gigabyte. Premium provides the rollover of unused traffic to the following month.